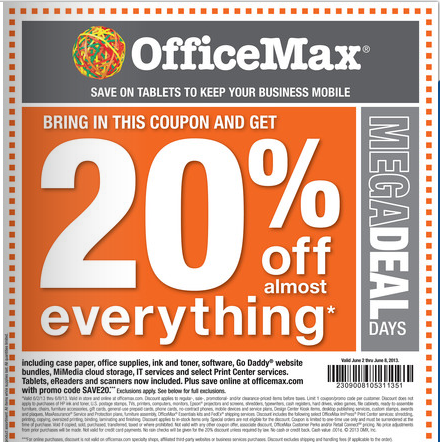 I went to Office Max today to buy something, and recycle some ink cartridges while I was there, and I was pleasantly surprised to find out that almost the entire store is 20% off this week if you have a Max Perks account. Valid June 2nd - June 8th. You can also save the same 20% online with promo code SAVE20 and free shipping on anything over $20. Start your purchase from Top Cashback and get up to 6% back as well, depending upon what you buy! You will still get your regular rewards from your credit card. Pay with Chase Ink Bold, Ink Plus, Ink Classic or Ink Cash and you will receive 5 Ultimate Reward points for every dollar you spend at Office Supply stores. You can also pay with an American Express business card that has OPEN savings and get 5% back at officemax.com on purchases up to $250 or 10% back on purchases over $250. American Express Starwoods Business card is an example of a card that has OPEN savings so random thought: if you have the choice between canceling the regular Starwoods and the business Starwoods, keep the business for the OPEN savings. Grand Total savings = 41% off if you spend $250 or more and use an American Express card with OPEN savings, 36% if it is less than $250 or if you use a Chase business card. $10 off my next purchase of $40 or more. It is only valid starting June 16th so I will have to go back. Any suggestions on something everyone needs that I can buy if I don't have particular needs at that point? Gift cards and stamps don't qualify.